Hipsters also carries NEW toys and baby gifts! 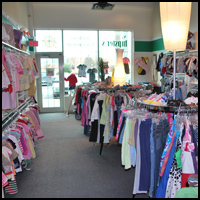 Thank you for shopping Hipster's Children's consignment! Hipsters will act as an agent for the consignor, therefore the articles placed in Hipster's will remain the property of the consignor until sold, picked up by consignor, given to charity or the consignment period ends. Consignor assumes and all risks and agrees to bear any and all losses which may result from fire, theft or any other casualty while the merchandise is consigned at Hipster's. Items placed on consignment will be priced and tagged by Hipster's. Hipster's reserves the right to promote special sales at the discretion of management. Consignor receives 50% of the final net selling price excluding tax. Payment to the consignor issued quarterly (30th of Jan/April/June/Oct) on the articles sold in the prior months. Amount due to consignors is available immediately as store credit. * No checks are issued for less than $40.00. * An annual registration fee in the amount of $7.00 will be deducted from the consignor's account. If no items are sold during the year, this fee is not charged to the consignor. The consignment selling period is 90 days to be reduced up to 50% after 60 days. After 60 days, the consignor must reclaim the items by picking them up or request to have items donated to charity. At the end of the 90 day consignment period, the consigned items become the sole property of Hipster's.